Is there a possibility you can make yourself ill by just thinking you are ill? How can we be mindful of becoming mindlessly aware? Can you refuse to have the menopause? I discussed this, and much more, with Ellen Langer, Mother of Mindfulness. 18 years ago exactly I moved in with a man I had only known for 2 weeks. All my instincts were screaming at me not to do it. Because you don’t do things like that, moving in with someone you’ve only known for 2 weeks. You don’t make decisions merely based on a smile. You don’t make decisions based on a smile when the smile belongs to a man who managed to keep you waiting for 20 minutes on your first date. You don’t make decisions based on a smile when the smile belongs to a man who managed to keep you waiting for 20 minutes on your first date and who told you, you weren’t his type. He didn’t like blondes, he said. He preferred brunettes, he said. You don’t do things like that, moving in with someone you’ve only known for 2 weeks, based on a smile. You don’t make decisions when your instincts are screaming at you that you shouldn’t do this. I’m glad I ignored my instincts. Too big Too Loud Too Much Choice Sensory Overload. There’s something odd about choice. Choice tends to be only really useful if it is limited to a certain amount. When it gets to Abundance Level it tends to mainly confuse, my mind tells me, while I narrowly avoid being hit by a trolley, pushed by someone who has “Christmas Fatigue” written all over her face. I smile apologetically, although I’m not sure why. Abundance is such a pleasant and positive word, my mind thinks for me, and I think I think my mind thinks too much, and that is never a good thing. “Maybe.” I repeat after my mind, out loud, but no one notices. I spot a bottle of bubble soap at the side of the till. I choose a pink one with fairies and place it in my basket with my groceries. I make chorizo the day after at a friend’s. I go to his village by car, past ruins and green and where time has stood still and where time will lose itself completely eventually, reclaimed by yet more green. I park the car at the edge of the village and walk past the old church with its cemetery which seems more alive than the village itself. The weather is perfectly fitting for me, the type of soul drenching fog which won’t clear by midday. I like the place where we make chorizo every year. It used to feel like home, as if I had been a peasant in a previous life, there is an old bed in the corner and a window which has a view you can only see if you stand on your very tiptoes, an old shotgun hanging from the beams. My friend told me a few years ago that farm workers used to live here in his Grandmother’s time. The place told me stories and I liked standing there and listening to them while I made chorizo. But this year I notice I don’t have the same type of bordering on the ridiculous sentiment. It is New Years Eve and the sun has just gone down and I stand outside with my pink bottle of bubble soap at the top of my stairs. My daughter says. It is a statement, an observation. And she gets her camera out and takes pics. She recognises that what is fragile and impossibly beautiful and does whatever she can to document it. “I’m 46.” I correct her. And I blow more bubbles. Blowing bubbles. This might be my new New Years Eve tradition: Reminding oneself of the devastating beauty of fragility. And I forgot how much fun it was. I went on a 22km run this morning, following part of the Pilgrims route. Pilgrimeniscing, I decided, as I was listening to Steven Covey’s 7 Habits audio book at the same time and I thought how I could engage in a Show Off Saturday on social media after this run, casually mentioning my mileage, which would indicate my level of fitness (excellent) and posting pics of views I encountered on the way (gorgeous) and perhaps jokingly mention that I only had one fall (no injuries) and had seen 12 dead salamanders on the road all in different states of squashedness and had pondered on the significance of that, if I were to see it as a sign. Looking for the meaning of life while being faced with squashed salamanders: perhaps that is the best description of facetiousness. But more importantly, the answer came from a bunch of My Little Ponies. Their level of cuteness was off the scale and I decided you’re allowed to show off a bit. As long as you know that in the grand scale of things it doesn’t really matter. What matters is stopping when you see cuteness and sing to it. The My Little Pony Theme tune in this case. Our village is on Google Street view. Not the entire village, but the main lane into it. I found it out by accident one day, while checking something on google maps and I was a bit shocked at first. Of course, progress cannot be stopped, and our village isn’t that remote at all, but I just didn’t like the idea that anyone could virtually walk around the lanes where I always walked. You could see my daughter and her friend playing on their bikes at the corner of the lane, faces blurred out. Villager S’s field. Our house from a distance. I virtually walked on, just for fun, to see who else had been captured. Villager C in front of my neighbour’s house with his donkey. That made me smile, that donkey had made it on google street view. Little snapshots of the village, just enough to see the contours, but nothing more. You can zoom in all you like on street view and it will look a little bit as if you’re there…but it lacks the details. Some people say it’s the bigger picture that is important, but I’m not so sure. I prefer experiencing things close up. It’s often where the really interesting stories hide, in the details. 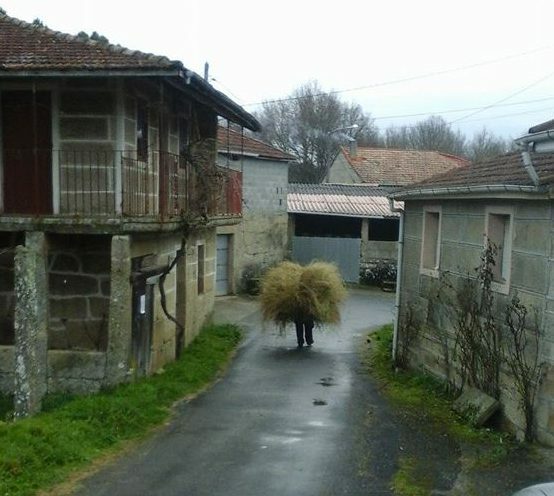 The rumble of Enraged Enrique’s ox cart, the hay which has been left on the lane by Villager J, the see through skin of Villager P’s ancient mother, the colour of freshly made chorizo hanging in the smoking shed. If you’d have asked me ten years ago what colour I could live without, I’d probably have said yellow. It never did anything for me. Too loud, too brash, too here I am look at me, vulgar, cheap. But in recent years, since living here, this has changed. I cannot possibly imagine life without yellow now. Bright yellow, the colour of mimosa which grows in abundance everywhere. It’s not a native plant and considered to be a pain in the neck, but I find it hard to dislike it. People use the stakes of mimosa for tomato and bean plants as well as vines and the bigger pieces as firewood. 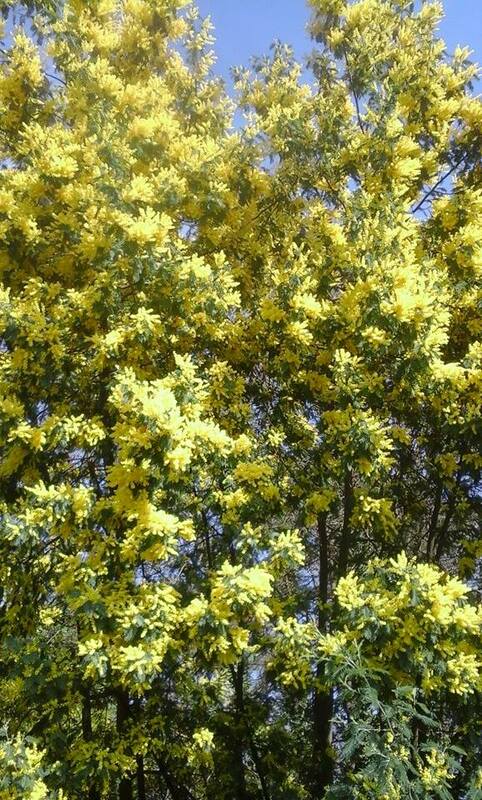 When you drive through Galician countryside in early spring you become aware just how prolific this plant is. It’s like one continuous firework display, as if nature has exploded. And the smell which lingers especially in the evenings is just… bright yellow. Another yellow is the yellow of gorse which grows in the hills. It’s a painful color once you’ve walked through it a few times. The branches leave horrific scratches. But the smell. A blend of honey roasted coconut. I’d hug the flowering bushes if it weren’t for the fact that it would hurt so much. 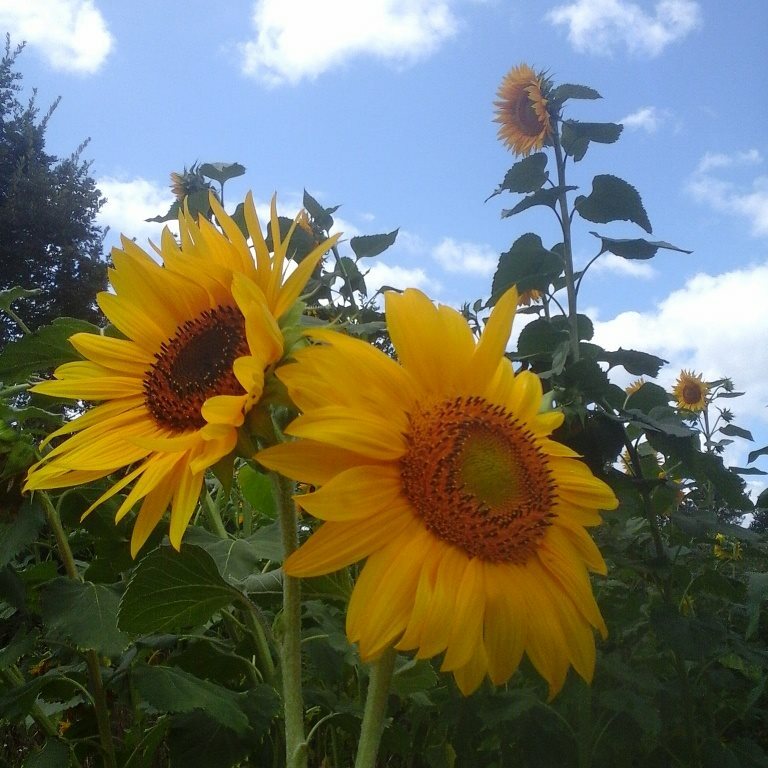 But the most invigorating yellow is that of sunflowers. Who on earth dreamed up these giant beauties? And how can anything possibly smell that good? I grew some a few years ago and I’ve allowed them to self seed, so every year I have more in the veggieplot. The villagers find it a bit strange and ask me what I do with them. They don’t understand that I simply want to stand under them and peer at all that insanely heavenly smelling yellow.